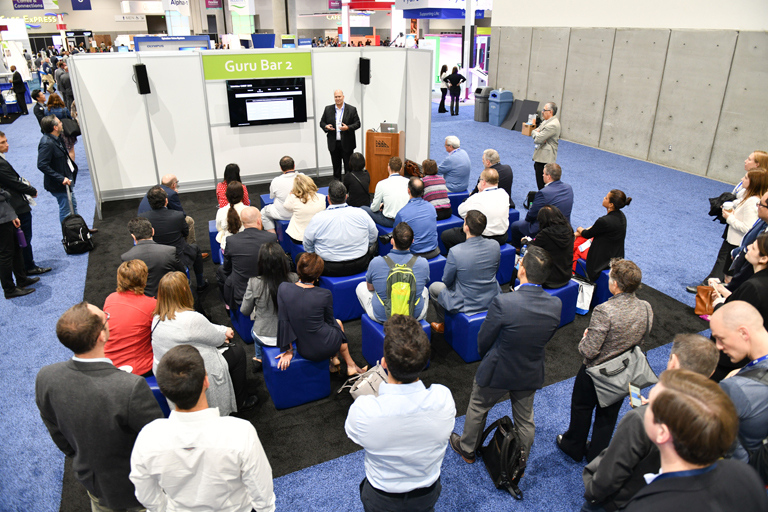 For sponsors looking for a budget friendly presentation option in the ATS 2019 Exhibit Hall, a Guru Bar presentation is the perfect choice. Guru Bars provide an intimate venue for sponsors to create a dynamic interaction with attendees. The sponsor is given the opportunity to do a brief presentation and then engage the audience with a challenge or question to prompt discussion. The discussion allows attendees to interact with both the presenter and each other for a richer educational experience. Available Sunday through Tuesday, this learning experience consists of burst sessions of 15-20 minutes, led by subject-matter experts from industry. A Burst Session consists of a 10-minute burst outlining a problem statement, mitigating factors, the host’s perspective/solution, and a challenge or question posed to attendees, who discuss for the remaining 5-10 minutes. 1:30 - 1:50 p.m. 12 - 12:20 p.m. Applicants select the top five choices for day, time, and location during the application process. Full Payment is due January 18, 2019. Programs are non-refundable after this date. A deposit is not required, but a $500 cancellation fee is incurred for any program cancelled after receipt of signed contract. Guru Bars are available on a first-come, first-served basis. Guru Bars are 20 minute programs and run every 30 minutes from 11:30 a.m. – 2 p.m. in the Exhibit Hall. Please be courteous and adhere to the allotted time. Programs running long risk having their sound system turned off. Space is available near the Guru Bars to allow for continued conversations and discussions. Each Guru Bar seats 25 people with standing room around the perimeter of the space. Programs offering CME/CE/MOC credit are not permitted. The use of any space within the convention center that is affiliated with the Guru Bar should support conference activities, and cannot be used in combination with developing CME/CE Material or any form of Professional Credit. A standard A/V package comprised of monitor, speakers, wireless microphone, and laptop computer is furnished by the ATS.